Whenever you try to connect an Android phone to any WiFi hotspot, your Android device try to obtain an IP address during the connecting process. If it fails to obtain an IP address, the device will disconnect and try again. After obtaining the IP address from the WiFi hotspot, you will see the connected message. What if the Android phone does not obtain the IP address after several retries? 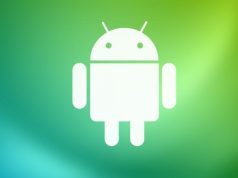 The Android phone will be stuck at Obtaining IP address loop forever till you fix it. Android phone WiFi stuck at obtaining IP address problem is a common issue that is faced by the Android users now and then. However, knowing the solution to fix this problem can come in handy. Most of the time the problem may be no problem at all and can be fixed with a simple phone/router restart. But, at times your device may be stuck at obtaining IP address due to an issue with your phone or Wifi router. Irrespective of the situation, here are a couple of solutions to fix “obtaining IP address” issue on Android phones. As I said earlier, the WiFi problem mentioned above can be a temporary issue and can be resolved with a simple restart. So press and hold the power key for a few seconds. When the options are displayed on your screen, tap on Reboot. After the reboot, go to Settings and open WiFi. Press and hold on the WiFi hotspot that is giving you the problem and select “Forget” option. Rescan for the available WiFi hotspot and try to reconnect to the WiFi hotspot again and see if you are able to connect to the WiFi. If the problem is not at your phone’s end, then it can be a problem with your WiFi router. It is a good idea to give your WiFi router a quick reboot every now and then as it may fix any temporary issues with the router. To restart the WiFi router, turn off the router if any dedicated buttons are available. Remove the ethernet cable and then unplug the router from the power outlet. Leave it idle for a few minutes and then reconnect the router and power it on. If forget network did not fix the problem then you can try to assign IP address manually to the connection. Here is how to assign IP address manually to WiFi network in Android. Go to Settings and tap on WiFi. Turn on the WiFi and search for the problematic WiFi connection. Long press on the WiFi connection and select “Modify Network” option. In “IP Settings” tap on DHCP and select “Static”. 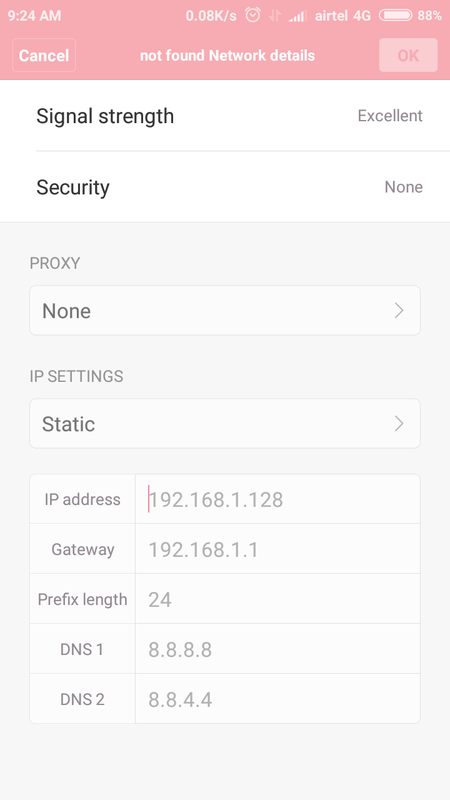 In the IP address field enter the IP address of your choice and leave other variables untouched and tap Save. While entering the IP address make sure that you enter a unique IP address so that the device does not conflict with other devices connected to the same network. For example: In the Android WiFi settings, check your Gateway below the IP address. If the Gateway is 192.168.49.1, then enter your IP address as 192.168.49.6. If you have recently made changes to the security settings of your WiFi router, then you may face obtaining IP address problem on your Android phone. Try disabling settings like Mac Binding, IP reserve etc. to see if it works. Also, make sure that you have setup DHCP and set the IP range properly. If nothing seems working you may want to reset your WiFi router. Resetting your WiFi router is easy. Look for the reset button around your router mostly at the back of your router. Press and hold the reset button for a few second until the lights start blinking. Leave the router for a few minutes and then reconnect the plug. Android developers have made several apps to fix WiFi issues with your Android phone. These apps usually fix common WiFi problem and help you connect your phone to the WiFi hotspot. 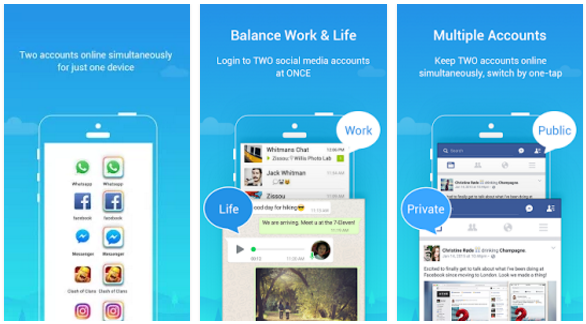 One such app is Wifi Fixer. Download and install the WiFi fixer app from the Google Play store. Open the app, and it will start scanning for any network problems. 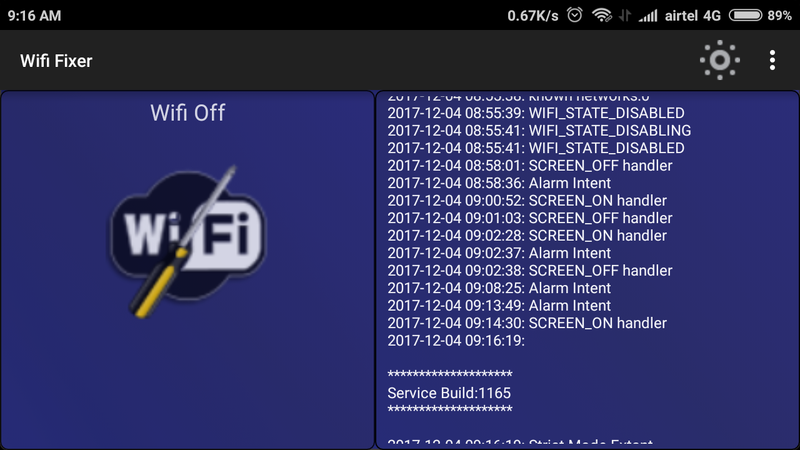 Make sure your WiFi is turned on and then let the app scan for the available WiFi network and fix if any issues with the network. The app also offers few more options. To access it do the following. Open the app and tap on the three dots and select Settings. Tap Services and then tap on Set WiFi Profile. 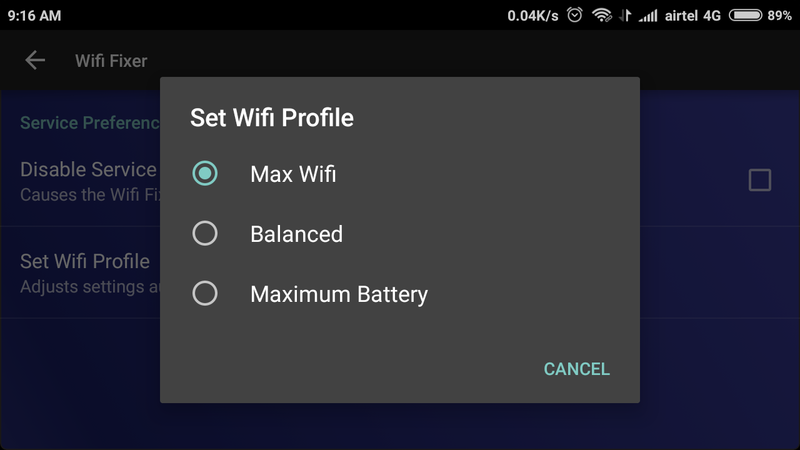 Here you can select the WiFi profile you need that ranges from Max Wifi to Maximum battery. So, these are some of the fixes to fix WiFi stuck at obtaining IP address problem in Android phones. Do let us know what worked for you and also if we have missed any potential solutions to this problem in the comments. I’m using Anycast Plus H-265 Version 10.88.14. In DLNA/Airplay/Airmirror mode, I have connected Anycast to TV using SSID and password. Then I have connected Anycast to router AP through IP address 192.168.49.1. The TV screen shows all connections are clear (without any red circle ‘x’ mark). But this TV screen with all connections clear remains still without collecting any IP address. So I have selected the ‘Cast’ button on phone in which it shows Anycast-17ec31-ITV. After touching this Anycast-17ec31-ITV, it attempts to connect but fails giving a message: “Casting screen to Anycast-17ec31-ITV has ended”. I have installed Wifi Fixer and both Anycast and router WiFi passed the test. Pls. note that in the WiFi it appears only as Anycast-17ec31 and in Cast mode it is Anycast-17ec31-ITV. Can u pls resolve this issue? Also, may I know if I can completely uninstall and reinstall Anycast firmware to solve this issue?